Recent events have contributed to declining trust levels in major public and private institutions across much of the world. These same institutions are now in a position where they will be forced to rethink their current trust-facilitating models. The proliferation of new trust-enabling technologies will further change how trust is facilitated and maintained in our digital age. The question is whether traditional institutions will be able to overcome their “trust inertia” in time. In recent years, society has struggled under a tremendous accumulation of trust breaches from institutions whose core purpose, ironically, is to serve as facilitators and safeguarders of trust. It comes as no surprise that the acclaimed annual trust survey published by Edelman shows that citizens’ trust in government, business, media and NGOs is hovering at an all-time low around the world. 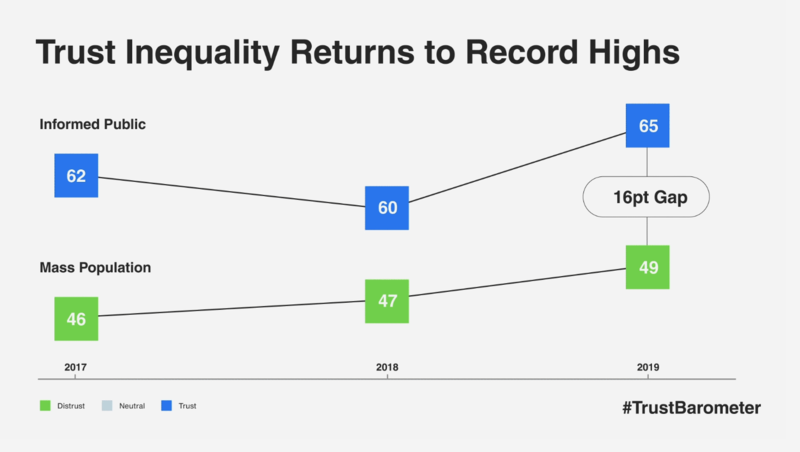 “An Implosion of Trust” was the dire summary of the 2017 edition of the trust survey, with a modest rise in trust levels in the 2019 edition. The US polling organization Gallup, which also measures public approval of central institutions such as banks, courts, congress and the church, paints a similar picture. And the OECD finds that trust in government is also deteriorating in many OECD countries, with only 42% of OECD citizens expressing trust in their national government. Among youth, trust in government is even lower. One could argue that key societal institutions are suffering from a case of “trust inertia” in a world characterized by accelerating change and growing complexity. Yet there could be light at the end of the tunnel, given the proliferation of new, advanced technologies with the potential to increase transparency and transform trust in ways that challenge the current, somewhat non-responsive, more centralized trust-facilitating models. A new trust paradigm in the making? Modern society has largely arisen based on the development of trust in centralized systems and institutions. Historically, this has happened with the growing centralization of state power and the associated development of judicial, monetary and other systems that made it possible to “outsource” trust from individuals to institutions. Nations with strong and transparent institutions generally have higher levels of trust, while nations struggling with widespread corruption experience the opposite. In other words, trust is a pivotal part of the social contracts that we rely on as the foundation of our societies and our economic models. But for a valid social contract to be upheld, citizens must fundamentally have trust in the institutions that keep society running. While these institutions have evolved over time, they still function in essence as trusted middlemen. Today’s established institutions and systems have an almost de facto monopoly on the facilitation of trust across most layers and levels of society. However, the contours of a new trust paradigm are beginning to emerge, where trust is created and maintained in new ways, and we no longer need to trust as much in opaque central authorities, global commercial monopolies or other middlemen to manage our trust mechanisms. The combination of declining trust in established actors and systems, as well as the rise of emerging trust-enabling technologies, and a much more tech-savvy, vocal and activist younger generation is driving momentum toward a paradigm shift for trust. The latest technological development driving a potential revolution in trust-facilitation involves so-called distributed ledger technologies (DLTs), with blockchain the most well-known. DLTs offer the potential to circumvent reliance on traditional, centralized actors and institutions as the primary intermediaries for trust. Blockchain has been one of the most hyped technologies in recent years, and its most enthusiastic proponents claim that the technology has the potential to change the world to the same extent as the internet. Blockchain was developed as the underlying technological framework for Bitcoin and is therefore often equated with cryptocurrency speculation. But the technology’s potential to create trust spans well beyond the realm of financial transactions. However, most DLTs still face obstacles to fulfilling their potential, such as scalability issues and heavy energy usage. In brief, a DLT system is a network of distributed digital ledgers in which every single participant in the network verifies and stores information through advanced encryption technology. In principle, the information stored on a DLT can be any data. It can be financial transactions between individuals, where one individual transfers money to another. But a transaction can also take the form, say, of a notification that a container has just been loaded onto a ship, or personal health data that you can share with your doctor. The most important conceptual advantage of DLTs is the “distributed” element. Today, the creation of trust in society is for the most part linked to centralized actors, who have in many instances proved to be untrustworthy and opaque. In a DLT system, the creation of trust is shifted to the technology and a distributed network of users who ensure transparency and immutability. In theory, this makes it possible to take the central actor such as the bank, lawyer, or social media platform, entirely out of the “trust equation”. The incentive for a break with centralized middlemen is also amplified by the fact that they are often expensive, burdensome, and in many instances, no longer inspire the required trust or confidence. It is considerably more difficult to restore trust than it is to retain it. There is no short path to regaining trust once lost. Perhaps trust in the established trust systems will suffer a deciding blow in the near future, concurrent with the rise of new trust alternatives and the continued “trust inertia” by established institutions. It may be difficult to imagine how a new way of registering and storing information in a distributed digital ledger can bring about massive changes in social order. After all, the trust solutions of the future will not immediately topple society’s established trust-facilitating institutions. But they will force traditional institutions to overcome their “trust inertia” and reinvent themselves with the help of the very same trust-enabling technologies. DLTs have the potential to either reinvent or undermine traditional trust facilitators, and established systems will undeniably be re-evaluated with the rise of viable trust alternatives that can offer a more secure, transparent, and in many instances, cheaper and faster way of managing trust. It will, of course, take time for the new trust-enabling technologies to fulfil their potential, with issues of scalability and energy usage still to be convincingly addressed. But the movement is underway.